The current diversity of transport services, as well as the complexity resulting from the deployment of specific transport protocols or mechanisms over the different services provided by heterogeneous networks, demand a novel design of the transport layer. Moreover, current and future applications will only be able to take advantage of the most adapted and available transport services if they are able to interact (i.e. discover, compose, deploy and adapt) efficiently with this advanced transport layer. The work presented in this book proposes a model-driven methodology and a service-oriented approach aimed at designing the mechanisms, functions, protocols and services of the next generation transport layer. 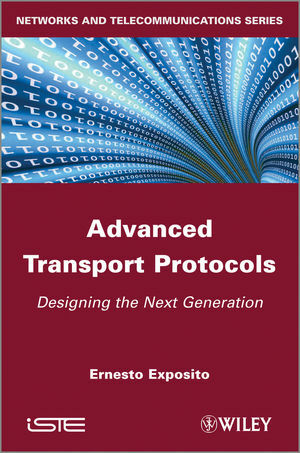 The first part of this book presents the state of the art of transport protocols and introduces a model-driven methodology and an ontology semantic model implementation aimed at designing next generation transport protocols. The second part presents the UML-based design of a component-based transport protocol. An extension to this protocol based on service-component and service-oriented architectures is also presented. The third part presents various model-driven adaptive strategies aimed at managing the behavioral and structural adaptation of next generation autonomic transport protocols. The fourth and final part presents the design of a transport layer based on component-oriented and service-oriented approaches and integrating the autonomic computing paradigm guided by the semantic dimension provided by ontologies. Researcher at "Laboratoire d'Analyse et d'Architecture des Systèmes" (LAAS) du CNRS, team SARA.